Inorganic nanoparticles, which can absorb and convert near infrared (NIR) light to heat to ablate cancer cells, have been widely investigated in photothermal therapy. However, the inherent poor solubility and acute systemic toxicity of these inorganic particles hinder their application in clinical practice. 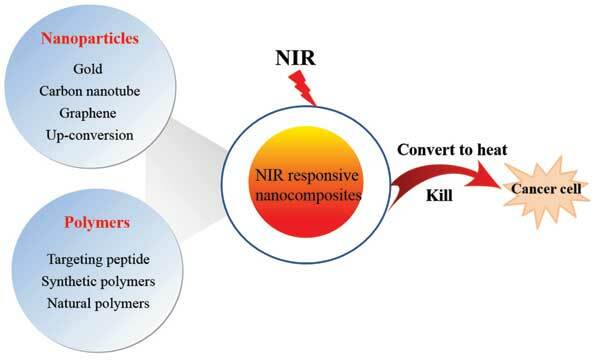 Polymeric nanocomposites materials containing both inorganic nanoparticles and polymers could be harnessed to achieve enhanced photothermal therapeutic effect as well as improved biocompatibility and multi-responsiveness. Synergistic chemo-photothermal efficacy towards cancer cells and tumor tissue can thus be realized through such multi-functional and multi-responsive polymeric nanocomposites. In this review, the recent developments in polymeric nanocomposites based on different types of inorganic nanoparticles (i.e. gold, carbon nanotube, graphene, and upconversion nanoparticles) for NIR-triggered cancer therapy are summarized. Near infrared, Photothermal therapy, Chemotherapy, Polymeric nanocomposites.